Apple is widely expected to launch an iPhone with a larger screen later this year. As this is expected to be a major upgrade, analysts expect a mid-year slowdown in sales followed by a blowout holiday quarter. In line with this expectation, Canaccord Genuity has released their regional installed base and sell-through estimates. Data from 2010 to 2013 is estimated from Apple's actual sell-through numbers, while figures for 2014 and 2015 are projected. This data is could be useful to understand current regional trends and analyst tendencies. This chart seems to be fairly representative as well. 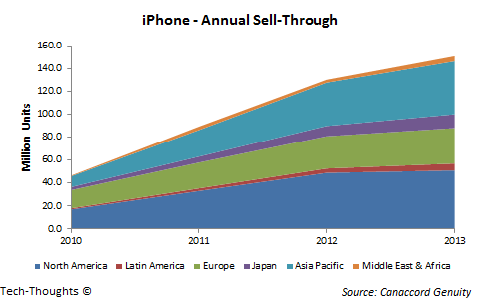 iPhone sales in North America and Europe seem to have flatlined. Asia Pacific seems to have slowed down, but Japan has continued to see strong growth. Broadly, these figures seem consistent with Kantar and Statcounter's regional market share and usage share figures. 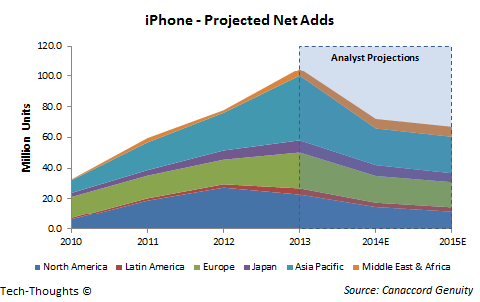 Canaccord Genuity also expects iPhone sales to continue growing at the same pace in 2014 and 2015 (which seems to be in line with consensus estimates). Their projections seem curious to me, especially given the breakdown of sales between net adds and replacement sales. This chart makes absolutely no sense to me. According to their data, the iPhone's replacement sales declined by roughly 12% in 2013, particularly in Europe (37% decline) and Asia Pacific (67% decline). 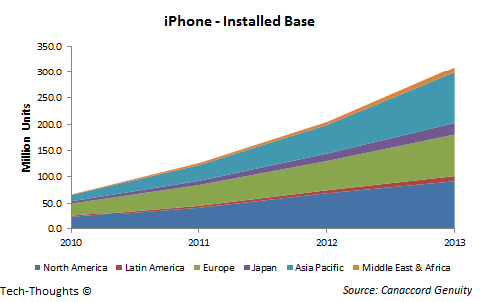 Notably, iPhone replacement sales continued to grow in North America, aided by the pricing structure. But in 2014, they expect the iPhone's replacement sales to grow by 133% YoY. Realistically speaking, replacement sales can decline for two reasons -- 1) iPhone owners are holding on to their "good enough" phones for longer periods (particularly during an "S cycle" product refresh), or 2) Some iPhone owners (particularly those who own legacy models) have replaced their phones with competing, "good enough" devices. 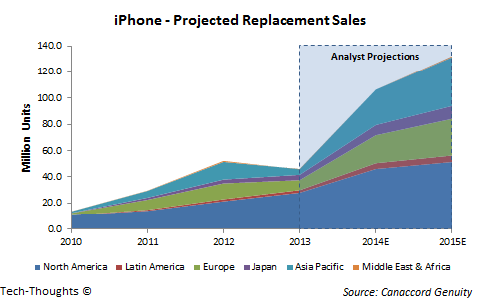 If "S cycle" iPhones cause a decline in replacement sales, why do Canaccord Genuity's projections for 2015 assume continued growth? If they expect larger screened iPhones to poach Android users, shouldn't we see strong growth in Net Adds (the previous chart)? From this particular chart, it looks like data from 2013 has been completely ignored and they've just extrapolated data from previous years.